Is there anything this beige Brassicaceae can’t do? This is another one of those recipes you need a food processor for. I know I’ve made fun of you before for not having a food processor, so I really don’t see an excuse for not having one at this point. Face it, I’m a food processor bully. Buy one now! 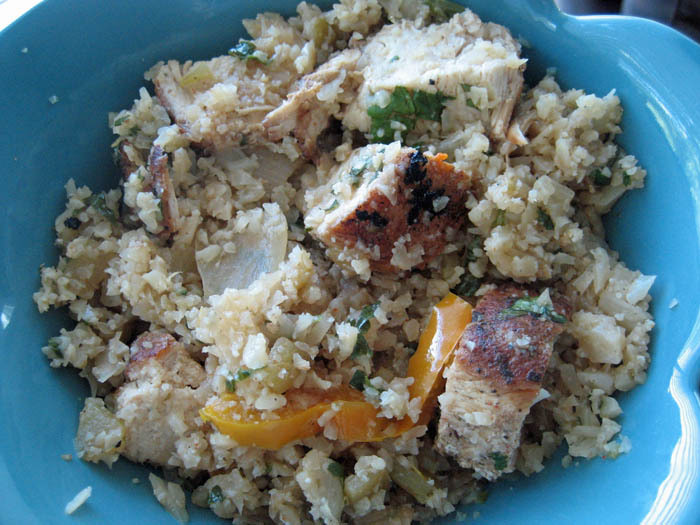 All you have to do to make cauliflower rice is pulse it and steam it. You should also season it, if you expect it to taste any good. When you’re done pulsing it looks like this. Before you pulse the cauliflower though (like 24 hours before) make sure you marinade your chicken. I didn’t read that note until I was actually preparing the recipe. 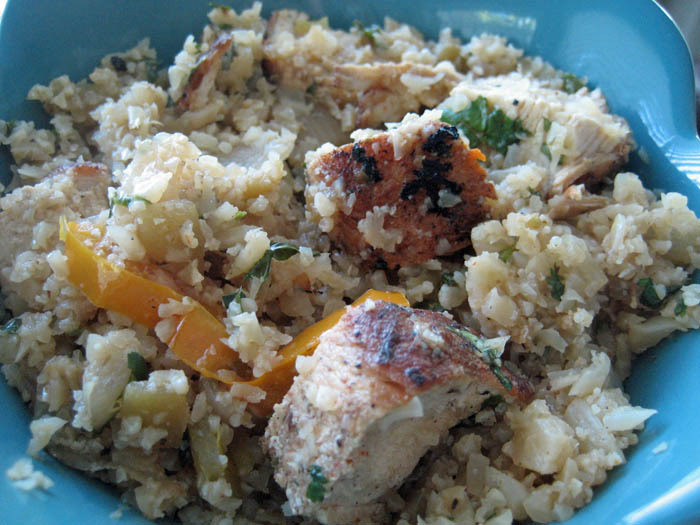 You could make this with plain chicken breasts, but the marinade makes it extra “Mexi.” The recipe author said she threw the chicken breasts in a ziploc bag with olive oil, chili powder, lime juice, salt and pepper. I did the same and threw in some cumin for good measure. Don’t ask me for measurements, just pour, shake and refrigerate. Or… if you’re out of time, grab those already marinated chicken breasts from the meat counter at your grocer. I happened to have some bell peppers on hand, so I chopped them up and threw them in to bump up the veggie factor. 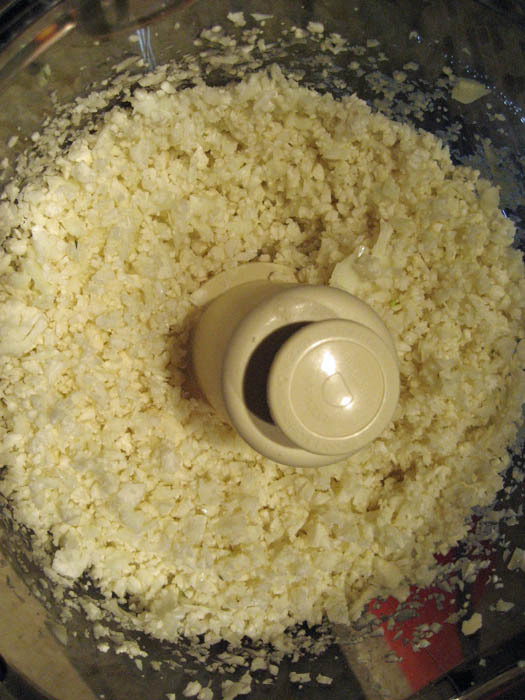 Place cauliflower in a food processor with the “S” blade and process until it becomes the texture of rice. In a large skillet, heat olive oil over medium heat. Add onions and cook for 10 minutes, until soft and transclucent. Add celery and bell pepper to skillet and saute for another five minutes. Add cauliflower to skillet, cover and cook 5-10 minutes, until tender. 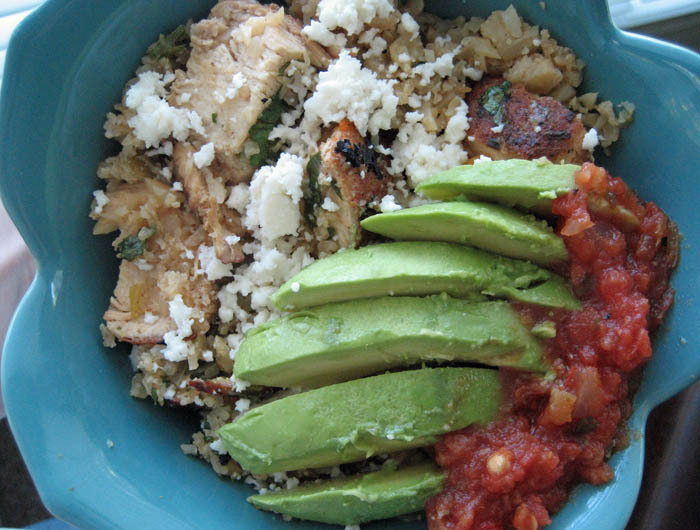 Serve and don’t skimp on the avocado, cheese and salsa. This looks SO good. I’ve never used cauliflower like this before, but… argh, your pictures are absolutely drool-worthy! I love anything Mexican, and I love the fact that you’ve slathered on some salsa, avocado slices and Queso Fresco. Definitely agree: not optional! Thanks for the recipe. Definitely trying this!!! Soon! Thanks for stopping by! I don’t think you’ll be disappointed. And the leftovers are great after a quick zap in the microwave.